STEP Ireland would like to invite you to our next seminar on Thursday 14 March in the Merrion Hotel when we will be delighted to have Brian Broderick of O’Hanlon Tax Limited provide a Revenue update. An informal lunch will be served from 12.30-1pm, with the seminar commencing at 1pm followed by Q&A. Free to all our members. Non-members are welcome to attend and should send a cheque made payable to STEP Ireland for €50 to Siobhán O’Moore, Mazars, Harcourt Centre, Block 3, Harcourt Road, Dublin 2. Please ensure to register your attendance with Eventbrite here. STEP Ireland and Irish Tax Institute are holding their joint annual conference on Thursday 28 February 2019 in the Hilton Hotel, Charlemont Place, Dublin 2 and online. This year’s seminar is entitled “Wills, Trusts and Family Structures: Getting the basics right” and the speakers are Lisa Cantillon (Kennelly Tax Advisers), Carol Hogan (O’Connell Brennan), Anne Stephenson (Stephenson Solicitors) & Muriel Walls (Walls & Toomey). Tina Quealy, Vice Chair of STEP Ireland will chair the event which will run from 08:30 to 12:00. All details of the speakers and how to book your place at the seminar can be accessed via the attached link. This year’s STEP Annual Conference will be taking place on Friday 24th May 2019 at the Hilton Hotel, Charlemont Place, Dublin 2. See further details here. At 18.30 in advance of the AGM, Anne Williams will speak on the changes introduced by the Finance Bill 2017. The AGM will be held at 19.30 followed by a wine and canapés reception. Venue: Matheson, 70 Sir John Roberson’s Quay, Dublin 2. Please register with Eventbrite to attend the event. 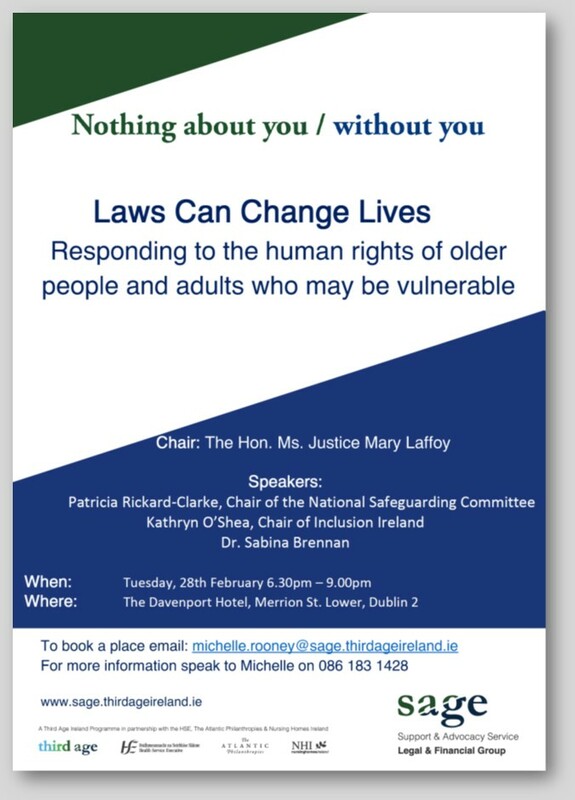 SAGE- Laws can change lives- Responding to the human rights of older people and adults who may be vulnerable. The Hows and Whys of Talking to Clients about Charitable Bequests.